On Wednesday, I turn thirty. Being a summer baby is wonderful in many ways, but with weddings and holidays it’s always been tricky to get everyone in one place at one time to celebrate. This year – the one so many of my friends have been hitting their third decade, deciding to get married or embarking on exciting adventures abroad – is no exception and my thirtieth celebrations seem to have extended to about six weeks worth of dinners, parties and weekends away. I’m definitely not complaining. We kick started proceedings with a week in Italy. First up was the house I’ve been visiting since I was little more than a cluster of cells wriggling around in my Mum’s belly and the place that my husband proposed. There was sunbathing and endless reading, far too much food and wine, feeding our local tame wild boar and gazing at the stars in an unpolluted sky. Towards the end of the week we drove down to the seaside and in 48 hours we ate in two 2 Michelin starred restaurants – one of them possibly my favourite restaurant in the world. Turning thirty turns out to be pretty awesome. Last week we had a birthday dinner out with friends, this week there’s a family BBQ on the actual day and next weekend I’m off to the Cotswolds for a surprise weekend away. 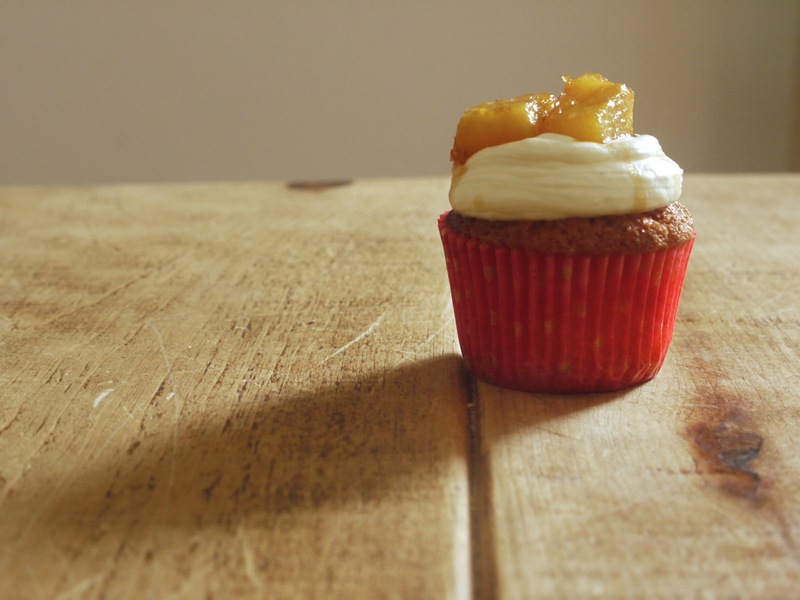 On Saturday we had a party, so I baked a batch of these cupcakes from Nina Parker’s new cookbook, Nina San Tropez. Nina worked at L’Anima and Gelupo, possibly my favourite place to get ice cream in London, and is an incredibly talented storyteller and chef. We also share a publisher and agent and if my cookbook turns out to be half as beautiful as hers, I’ll be a very happy lady. 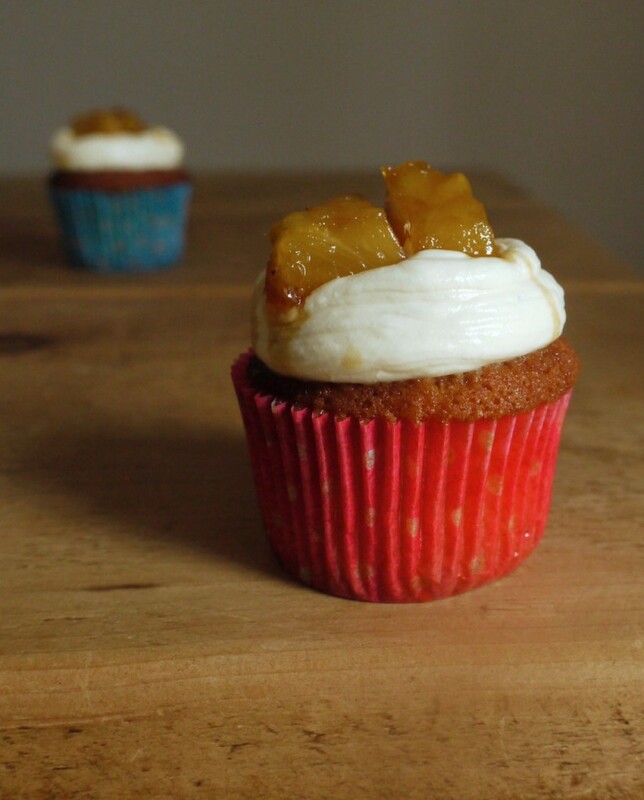 These cupcakes are rich with vanilla, topped with slices of sticky caramelized pineapple and a not-too-sweet frosting. The original recipe calls for mascarpone which I didn’t have to hand so I freestyled with a combination of double and sour cream, adding the juice of some freshly grated ginger as it works so well with pineapple. I’d love to say they were hoovered up by the hungry hoards but unfortunately when our taxi was more than half way to the bar, I realised I’d left the whole damn lot on the kitchen table. Carnivorous Husband ate three in a row when we got home though, so it’s safe to say this recipe’s a winner. 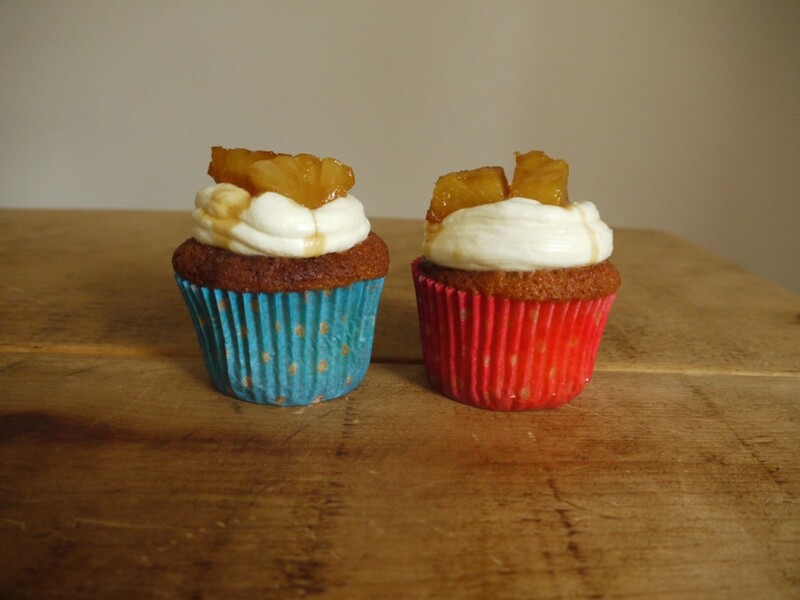 Sweet, sticky and rich with vanilla, these cupcakes are adapted from 'Balcony Cupcakes with Caramelized Pineapple and Mascarpone' in Nina San Tropez. Preheat the oven to 180 degrees C/160 fan. Line a 12-hole muffin tin with paper cases. In a stand mixer, cream the butter and sugar until light and fluffy. Split the vanilla pod in half lengthways, scrape out the seeds and add to the mixer. In a small bowl, whisk together the eggs and milk. Gradually add to the butter mixture until incorporated. In a large bowl, sift together the flour, baking powder and salt. Gradually fold into the batter until just incorporated, then divide between the paper cases. I had enough batter for one extra case. Bake 24 - 30 minutes (my cakes took 24), until light and springy to the touch. Remove and cool on a wire rack. To make the pineapple, gently heat the sugar and butter in a frying pan and cook to a light, golden caramel, about 10 minutes. Add the pineapple and leave to caramelize for a few minutes, then turn with tongs, spooning a little sauce over the fruit. Remove from the heat and set aside to cool. To make the frosting, whip the cream until sot peaks form. Fold in the sour cream. Squeeze the ginger so that the juice goes into the cream then fold in 1 - 2 tablespoons of caramel from the pineapple pan. Pipe or spoon the frosting over the cooled cupcakes. 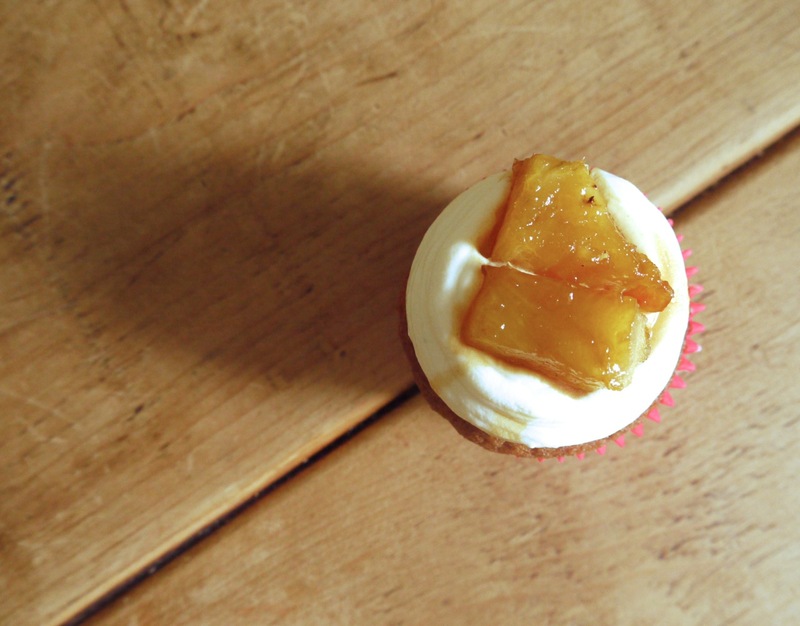 Thinly slice the caramelized pineapple then arrange over the top, spooning over any extra caramel. what a way to celebrate :)) An early Happy Birthday from me !! Gorgeous cupcakes! Love the unique flavour combo with the caramelized pineapple and yummy sour cream frosting. It’s a cream as much as a frosting – gives just enough tang to counteract the sweet sweet pineapple. Lovely flavour combination! I love the caramelised pineapple. I will be trying it soon! These cakes look gorgeous and the flavours sound delicious. I just love the way the pineapple is oozing delicious juices onto the icing. Happy 30th! The ooziness is the best bit! Caramelized pineapple is soo good. I believe everyone should spend the month celebrating their birthdays – congratulations on your 30th!! Your cupcakes look delicious. I can personally vouch for these! Absolutely beautiful … The perfect end to a fantastic evening, thank you Kate. I hope you have a very wonderful birthday! It sounds like you have had some amazing time to celebrate already. I feel the same way about the summer bdays, though… I’ll celebrate with family close to my actual 30th and then we are celebrating with friends a couple of weeks later when people are back to more normal routines! 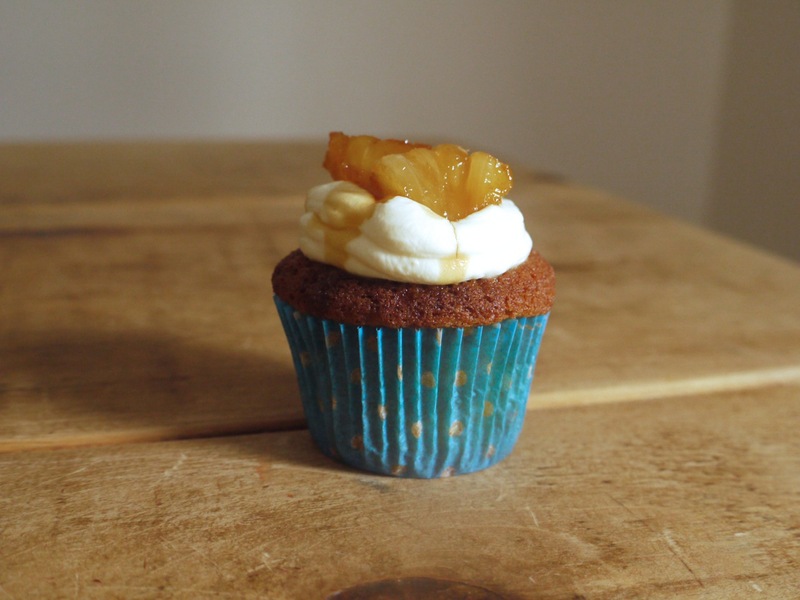 Caramelised pineapple – bliss! These look beautiful. We just baked actually – isn’t cake great? Happy birthday! These cupcakes sound like a dream… a dream I never want to wake up from. So much yum! Happy happy birthday week/month! I’m so glad you had a good time in Italy and long may the celebrations continue. Kate! Happy 30th birthday to you! What a year it is for you. my friend. And you’re only 30!! So exciting to hear that your book is already up on Amazon… woo hoo! And I hope all goes well with your photo shoot. Fun stuff, indeed! 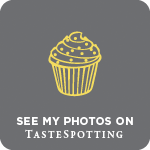 I can’t tell you how much I love the idea of these cupcakes! I adore ginger and pineapple always takes we back to trips to South East Asia. I flung myself onto an adventure abroad as soon as I turned thirty! And I’ve never looked back since!